Silk-effect graphite lacquered doors with silver finish trims. Wall unit doors with 0,4 cm thick, tempered, Desag glass panels. Brushed silver finish Elite Arco handle. Honed matt grey, 4 cm thick, Carrara marble top with Elite shaped edge. Elite chair upholstered with ecru cotton. The framed door is decorated by a molding with a strong character, beautified by a silver trim that is applied by hand on all the frames. The same silver trim runs along the side pilasters the top in grey Carrara marble blends in with the design of the furniture thanks to its exclusive Elite shaped edge. The under counter sink bowl completes the precision of this arrangement. The Elite arco handle shines in the brushed silver finish while co-coordinating perfectly with the door trim. The shaped Elite edge protrudes gently and picks up the curvy shapes of the half-pilasters on which it rests. Tradition blends with the most advanced technology to increase the functionality of the kitchen with the latest generation of household appliances. The wide, fluted pilasters that embellish the sides of the hood conceal pullout doors with baskets behind their front panels. The Elite knob makes for easy opening. The interior structure of the jumbo drawer belongs to the white Intivo line and has satin glass sides. 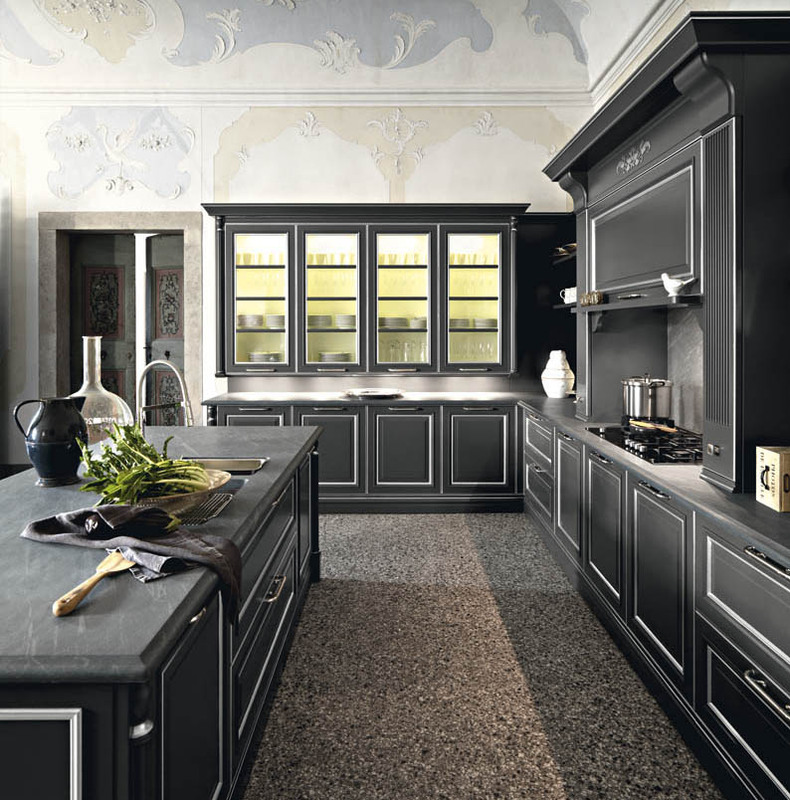 The large 180 cm hood sets off and celebrates the kitchen, becoming the hub of the home. The top of the hood is decorated by a graceful embellishment in stainless steel, cut out and flush fitted onto the panel, while the back panels that flank it are completed by practical shelves.